Since my youth I love the comics by Jack Kirby. Just as long I draw myself and though Kirby’s work always was an important reference point my drawing, it never came to my mind to draw a declared homage to Kirby. Only in the winter 2015/16, stimulated by reading Erik Larsen’s SAVAGE DRAGON, I started to think about drawing a comic that mimics the stylistic elements and narrative structures of Kirby, exaggerates and plays with them. When I learned that a group of Viennese comic creators (Tisch 14) planned an anthology under the Theme of „Fairy tales“, a project took shape: „Little Red Riding Hood – ­ the Jack Kirby Version“ At first I thought I could just implement the well­-known fairy tale by the brothers Grimm in Kirby’s characteristic style, but after the first sketches of the characters it became clear that I had to rewrite the tale. The heroine Little Red Riding Hood had to be a superhero, and the grandmother should be more powerful than normal people to have her place in a kirbyesque cosmos. But that changed the balance of power, which is so important for a story: The wolf was no longer the major threat, on the contrary: If Little Red Riding Hood and her grandmother were powerful, the wolf was suddenly the victim. This allowed me to touch some topics that are close to my heart, such as environmental protection and animal rights. I decided that the story would be staged in a version of Asgard, somewhere between the home of Kirby’s Thor and the New Genesis of his New Gods. 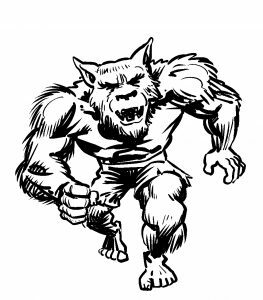 The shape of the wolf was immediately clear to me: a werewolf in Kamandi’s pants, his body shape should be reminiscent of hulking monsters like Ulik or Kalibak. Rotkäppchen became a confident young woman, a bit naive, but with a good heart. Thors Lady Sif and the young Crystal of the Inhumans were her role models, she got a tight outfit and ­ to identify her as a superhero ­ Captain America’s gloves and little wings on her red cap. As I had her wear a cap and not a riding hood, I had to stick with the original german name Rotkäppchen, which literally means Red little cap. Now it was clear that the grandmother had to take the role of the big bad, and I made her the ultimate Kirby villain: In addition to the personality of Granny Goodness she got the looks of Modok, the power of the high Evolutionary and menacing intentions like Darkseid or Galactus. I transformed the hunter from Grimm’s fairy tale into a crowd of knights or soldiers in the service of the grandmother, each in a different style, no one appears twice, all more or less faceless. Doctor Doom’s robots from Fantastic Four 84 to ­87 and many similar figures from different stories influenced their design. Because it seemed inappropriate to me that these hunters would address Rotkäppchen and her grandmother with „Rotkäppchen “ and „grandmother“, these characters needed new names, and finally the wolf got one too. The trio Rotkäppchen, Wolf and grandmother in their new and kirbyfied shapes reminded me a little of Ariel, Caliban and Prospero in Shakespeare’s „The Tempest“, at the same time the Icelandic form of the family name allowed me to anchor Rotkäppchen and the wolf in Norse mythology: Rotkäppchen as the daughter of Donar, a.k.a. Thor, and the Wolf as the son of Fenris, the mythical wolf that plays its role in the Nordic version of the end of the world (Ragnarök): thus the names Aria Donarsdottir, Kalib Fenrisson and Prosperina were found! While working on Rotkäppchen, I discovered that Kirby has made a version of Little Red Riding Hood himself. And it even plays in Asgard! It was called „The Golden Apples“, appeared in Journey into Mystery 114 and crossed Grimm’s fairy tale with the Nordic myth of Iduna. It had neither fistfights nor cosmic conflict, no machinery and no Kirby Krackle. The elements of style that I wanted to have in my Kirby homage, are missing in Kirby’s own version. So in trying to emulate Kirby’s style I made a version of Rotkäppchen more kirbyesque than as Kirby’s own, which is quite an achievement. Am Sonntag den 2. April ist es wieder so weit! In der MCG-Halle im 3. Wiener Gemeindebezirk findet von 10 bis 16 Uhr die Vienna Comix Market statt! Ich habe dort einen Tisch und werde Karikaturen von Besuchern zeichnen und über meine Zeichenkurse informieren. Zeitweise werde ich die KollegInnen von ASH, Tisch 14 oder Eurocature unterstützen, die ebenfalls mit je einem Tisch dort vertreten sein werden. Illustrating science fiction and fantasy stories allows me to give substance to one of my favourite subjects: the fantastic. To show something that previously has never been seen, that does not exist in the so-called reality, but could be imagined. A picture makes it easier to imagine. In this sense, my illustrations are windows to fantastic worlds, or rather doors for the fantastic to enter. Am 8./9. Mai habe ich (wie schon hier berichtet) am 24-Stunden-Comiczeichnen gegen Rechts teilgenommen und 24 Comicseiten gezeichnet, allerdings die meisten nur in Bleistift. Inzwischen sind alle 24 Seiten in der endgültigen Filzstiftfassung fertig. Hier ist der komplette Comic Zur Lage der Nazion als pdf zum lesen, runterladen, weiter verbreiten. Viel Spaß damit! Die Vernissage am 11. Mai war gut besucht, die Grünpolitiker Klaus Werner Lobo und David Ellensohn gratulierten mir zu meinem „sehr bösen“ Comic, angeblich soll auch die Chefin der Wiener Grünen, Maria Vassilakou , sehr darüber gelacht haben. Mein Comic wird demnächst auf www.comicgegenrechts.at erscheinen. Den FALTER-Artikel habe ich hier hochgeladen. http://bigessaywriter.com/blog/category/services/page/2/ bei Comics sind Kunst! Michael Wittmann bei Keine Angst! Jenisch Gerhard bei Keine Angst!